Prime Minister Abiy Ahmed and Eritrean President Isaias Afewerki signed a historic peace agreement on 16th September in Jeddah, Saudi Arabia, in the presence of Saudi Arabia’s King Salman, Crown Prince Mohammed bin Salman, and United Nations Secretary-General Antonio Guterres. The Jeddah Peace Accord is aimed at strengthening security and stability in the region at large and is the second peace deal the two countries have signed since they ended decades of enmity in July by signing the “Joint Declaration of Peace and Friendship”. Since then, relations between the two countries have gone from strength to strength. On 11th September, two land border crossings between Ethiopia and Eritrea were reopened for the first time in 20 years. Air links, embassies and trade routes have also been re-opened. PM Abiy and President Isaias were also awarded the Order of Abdul Aziz Al Saud Medal, the kingdom’s highest civilian honour, for their efforts. 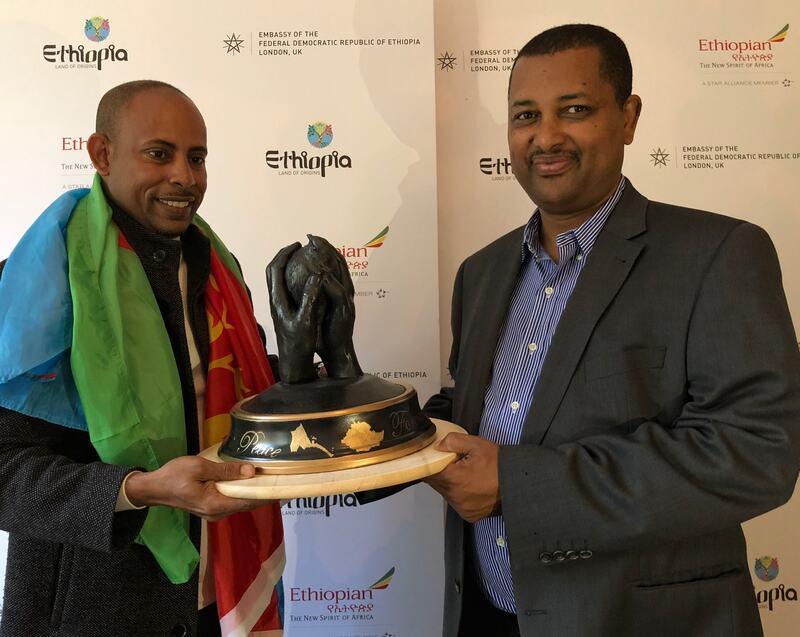 Following the historic rapprochement between Ethiopia and Eritrea, London-based Eritrean Artist, Biniam Ghide, felt compelled to construct a sculpture of peace for Prime Minister Abiy Ahmed. Biniam showcased his artwork at the Embassy in the presence of the Head of Diaspora Affairs, Mr Fekadu Beyene. The Embassy will facilitate the delivery of the sculpture to the Prime Minister in Ethiopia. Biniam now dreams of making a large sculpture/monument on the Ethio-Eritrean border.